With a boyfriend who is quite pleased with the way the apartment looks right now, I have taken it upon me to really get space decorated. The home office/dressing room was a no-brainer and we decided pretty quickly on how we wanted to decorate our living room as well (still a plan in progress though), but the bedroom? No. The bedroom still is just a big room with not much more than a bed. We don’t even have light up in there. Now that we’ve been living here for a few months and have got most of the bigger expenses out of the way, we have a new budget to really give things a “home” feeling. Here’s what I’m thinking for the bedroom! 01 / Nymö lamp from Ikea – Hanging central in the room, this lamp would be the eye catcher. We already have it, we just need to hang it. And that my friends, is more challenging than it would seem. 02/ Round mirror from Xenos – I spotted a round lamp with rope at Leen Bakker, but at €44.95 that one was over the budget. This one with a leather strap from Xenos comes at a much friendlier €25 and would be just as perfect! 03/ Panama table lamp from Marks & Spencer – M&S is not shipping these to Belgium, so we will have to continue our search for the perfect bedside lamps, but boy oh boy are these the ones I’ve been looking for! 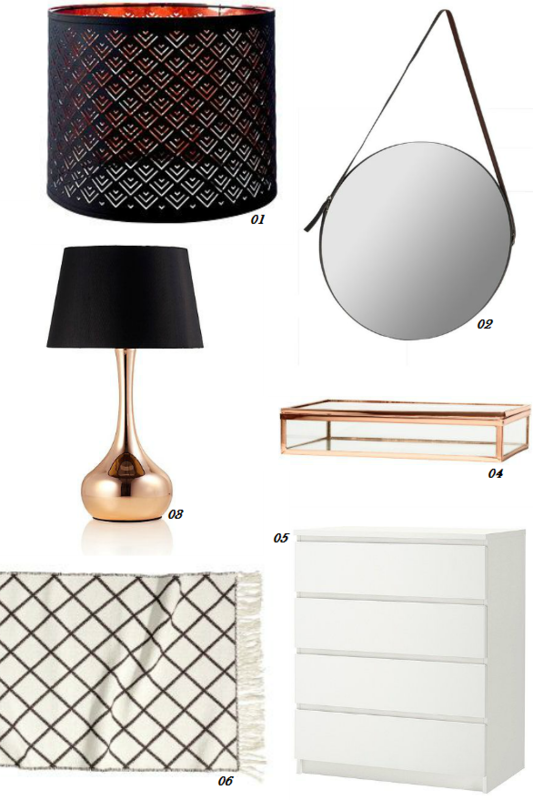 04/ Glass box from H&M Home – I’ve been loving glass shade boxes for a while and this copper one from H&M would be perfectly complimentary with the rest of the room. I’m thinking about using it to display small trinkets that we have lying all around right now. 05/ MALM chest of 4 drawers from Ikea – We have the MALM night stands and I would love to compliment them with the MALM chests of 3 and 4 drawers. They’d give us enough space to store our bed linnen and a lot of the little bits and things that currently don’t have a place (books, souvenirs, CDs, … ). 06/ Jaquard woven floor mat from H&M Home – I simply love the pattern on this! It would match greatly with our wooden flooring and is minimal, yet give the room that extra touch. Previous Post Oppa Gingham Style! You’re making me want to shop for our new place (which we don’t even have yet!) I love your design style. All of these are just gorgeous pieces! I’m looking forward to finding and moving into our new place and getting to decorate it a bit more, our current place is rather small and we haven’t bought much to make it look more impressive. I am loving these finds so much – I am such a fan of black and white clean modern. I actually own that lamp shade from ikea and absolutely love it! I love that rug and mirror! 🙂 I never look on H&M home, kinda because I forget it even exists haha, but I guess I’ll need to have a little browse now! Aaah hier word ik blij van. Mooie items! En goed om te weten dat ze die spiegel met lederen riem hebben bij Xenos voor zo’n mooi prijsje! !